Many of us have added “friends” without setting lists or permissions, which grants open access to all posts, regardless of the relationship, and in the early days of Facebook, it wasn’t considered an issue. However, as the use of Facebook has evolved, we have learned that not everyone wishes to, or should have access to EVERYTHING we post. For this reason, it is a good idea to create categories based on relationship or interest. 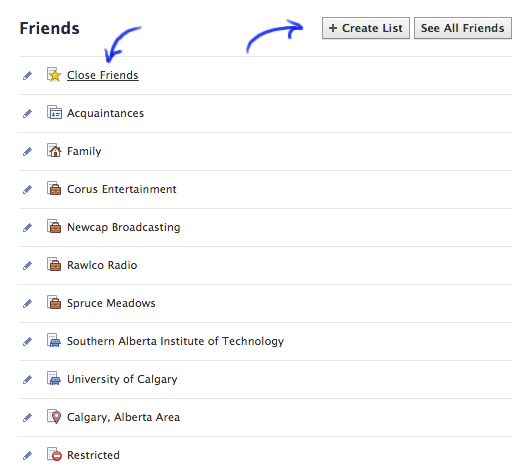 To do this, click here – FACEBOOK LIST CREATION and click on “Create List” at the top right. To edit existing lists (you will see these on this page) simply click on the list name. There is also a new feature called “Smart Lists” which automatically update and allocate based on people’s posts. This will save you time, and is very handy for those with a lot of friends or categories. Facebook will introduce you to this feature automatically as you attempt to edit a list. The benefits of lists are that you can share information relative to one group, but perhaps too personal or not related to another. This is great way to share baby pictures with family for instance, while not inundating your friends or co-workers. This also allows for greater security, especially for those who use Facebook to network. By creating a “networking” or “acquaintance” list, you can limit the posts to this group, thus retaining more personal information for family and friends. Below is an example of my “lists” and what your page might look like, with blue arrows indicating where you add lists, or click to edit lists or organize friends under existing lists. 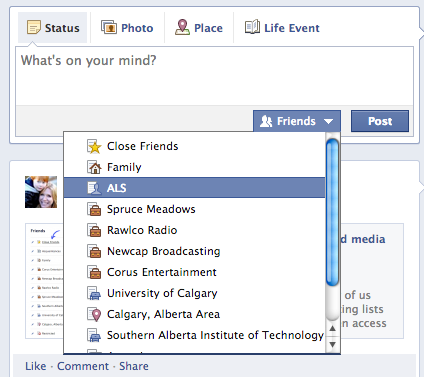 Finally, once the lists are created, you will now see the option of who to share with every time you post. I have included my own screen image to show how it might look when you are posting on Facebook. Note that your default setting may be changed in Facebook settings, which I will go over in greater detail on a future Social Media Tip. It is true that most of us at this point have read the key things NOT to do on Facebook. What you may not be aware of is that while you are playing safe, someone on your friends list may not be, and that one person could grant hundreds of strangers access to your page. For example, I have approximately 500 friends on Facebook, and I screen them to ensure that they are people I know and trust. The rule is, if I wouldn’t wave at you at a coffee shop, then you probably don’t belong on my FB . However, I have a teenager and I have friends who use their personal page for business, and these two elements could cause an issue. Those friends, through their feed, have granted access to everyone on their list, and quite frankly, it is a safe bet that only a fraction of those so called “friends” are actually friends. For example, through my stepchild’s Facebook page, I can view her friends and as most of them have fully accessible pages, I can view their friends. Now I am certain that my child’s friend, Rowan (named changed of course) is not at all concerned that I might creep her page. However, Rowan’s mother would probably prefer that I not surf her family vacation pictures and know that she was in Dubai and Houston over the past year, or that she has three girls and two boys, and that I know approximately where they live and what they do… and I know this without really even trying, because I am not a creeper, just a social media geek. Scary, right? I think so. So what do you do? First thing is to talk to your kids and FB friends about privacy settings. I recommend that security should be set that only friends have access to your information (not friends of friends) and that your friends list be kept private. To do this, go to your profile – go to your “friends” list and click “edit”. As you can see, mine is “locked” (that would be the little padlock image there). The second thing to do is if you are using FB for business, SET UP A BUSINESS PAGE! I know, maybe is seems egotistical to create a page around your personal business if you are a small operation, but please, get over it. It is not about you, it is about safety and security of your friends and family. The moment you add strangers to your page, you give them access to information that may not be yours to share.